Although I majored in Biology, I spent many hours in college studying art history. At the time, it never occurred to me to actually paint anything. I was a writer in my spare time, not an artist. All I wanted was to express something beautiful and appealing that held more than ordinary significance, all with words. Strangely enough, a couple of years ago, I began having an urge to paint. I wasn’t sure what I would paint or how it would look but just as I have an odd love of writing or typing letters onto a blank page, I found myself wanting to slide color across a white canvas. I wanted to feel a brush in my hand and make the paint fill up the nothingness in front of me - like words emerging on paper -creating something that wasn’t there before. I began to wonder if all the things I had to express just might not fit into words. I wondered if I had creative ideas that might be best expressed visually. Now that I’ve been painting for a couple of months, I see that it’s true. The primary definition of art is the quality, production, expression, or realm, according to aesthetic principles, of what is beautiful, appealing, or of more than ordinary significance. How is this so different from literature? Sure each requires different tools and techniques but the common denominator of creativity is there. So I’m asking why I should limit myself to one form of expression. But is it really art, good art, that I’m creating? What is good art anyway? Prior to a month or so ago, I’d never painted anything in my life so I wondered what right I possibly had to imagine that I could paint something meaningful. It could be junk. In his book, The Accidental Masterpiece: On the Art of Life and Vice Versa, Michael Kimmelman, Chief Art Critic for The New York Times, says what makes art good is partly its power to proliferate as a variable memory, an intangible concept, filtered through individual consciousness. He says that art is, first of all, a physical object with which we interact in the moment. But after we have seen a work, what do we take away except a memory of it? A memory is a thought, a mental seed planted by the artist, which is reproduced in as many different variations as the number of people in whom the memory exists. According to author of Party of One: The Loners' Manifesto, Anneli Rufus, artists hear what no one else hears. They see what no one else sees. They say what no one else says. They must. And to do this, they traffic in the slippery yield of their own souls. They bring to earth the wrack and lode of depths that only they can reach and still come back alive. It’s not always a fun process but if something can emerge that is beautiful, authentic, and meaningful, the dive is worth it, at least for me. If I can eventually create a visual expression that not only produces a response in the moment, but that expands into a lasting memory, or at least an afterthought, I may succeed. This is, after all, exactly what I strive to do using words. At the heart, it is all about vitality, sensory input, and the unlocking of the psyche through human emotion, the link we share despite time and place and circumstance. It's the song that validates through its perfection and the movie that touches a personal or societal nerve, lingering in the mind. It’s the book that lays something significant bare, cracks it open, even if it’s simply your own heart, and perhaps it’s the painting that dives into your gut and pulls out the thing you thought you’d lost, or the thing you never knew you had. 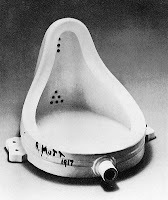 In 1917, Marcel Duchamp challenged the art world by proclaiming a porcelain urinal as art. His bold move significantly influenced modern art. Anything is art if you think it is, whether it’s a picture hanging in the IHOP or mounted in the Metropolitan Museum of Art in New York, whether it's your child’s coloring book picture or your teenager’s photograph. The same could be said for words. Your favorite poem may be the one your husband wrote for you, or your favorite book may be the bodice ripper you read at the beach last summer. These were all created by individuals choosing to express something important to them. You’ve validated their expression by placing their work on your favorites list. And who are you? You may be my neighbor or you may be Michael Kimmelman. So if this is true, how do we know which painting will land in a gallery or museum one day. How do we know which book deserves publication or a Pulitzer? If one man’s junk is another man’s treasure, how can we stop expressing ourselves for fear that it just won’t be good enough? I envy those who create simply for fun or economic necessity. They enjoy a hobby or industrial mentality that gives them release, relief and reward. It’s fun for me, too, but on top of the fun, I can’t seem to stop wanting what I create to be better than the best, perfect, wonderful, mind boggling, unique, and unforgettable. I can’t seem to feel the release, relief and reward as readily as I’d like. But I won’t stop reaching for it because I can’t. That’s the sort of cursed existence Anneli Rufus describes as the slippery yield of the soul.